"Really good!! 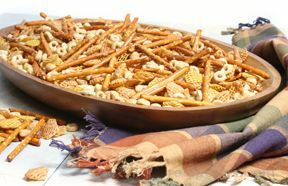 I used 3 cups of Crispix/ 3 cups of Cheez-its and everyone ... read full review"
In a large baking pan (9" x 13" x 2") combine crackers, pretzels, and peanuts. Set aside. In a small bowl stir together butter, Worcestershire sauce, lemon juice, garlic powder and onion powder. 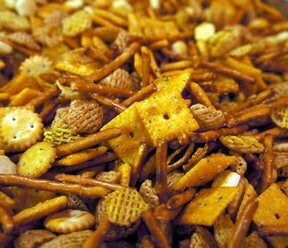 Drizzle over the cracker mixture. Stir until evenly coated. Bake at 250° for 45 minutes, stirring every 15 minutes. Spread on foil to cool. Store in an airtight container. "Really good!! 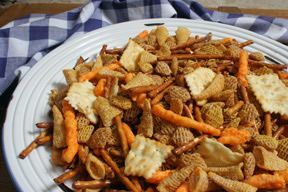 I used 3 cups of Crispix/ 3 cups of Cheez-its and everyone enjoyed it."